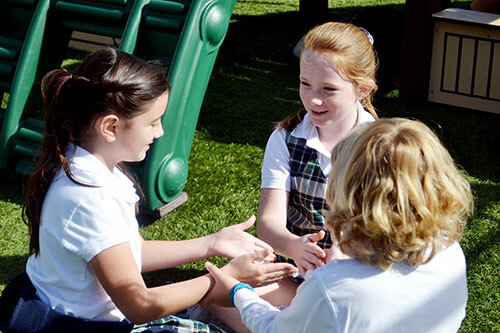 For the orderly and harmonious functioning of the school as an educational environment and for the purpose of teaching social behaviors in combination with the academic curriculum, Stella Maris Academy has adopted and implemented a Social Skills Curriculum based on the Boys Town educational model. To achieve a clear and verifiable outcome the teachers and staff have been provided with sound theoretical principles and practical approaches to guide them in their teaching efforts. The foundation of the social skills is a structured educational approach that offers a well defined and manageable set of social behaviors that encompass adult relations, peer relations, school rules and classroom behaviors. The skills assist the teachers to go beyond merely describing problem behaviors to identifying alternative prosocial behaviors and their components for instruction/learning. A very important component of the Social Skills Curriculum is TEACHING INTERACTION. Its purpose is to teach alternative behaviors and consequate inappropriate behaviors in a calm and positive manner. Teachers and staff receive training in the use and implementation of the entire curriculum. The Social Skills Curriculum is taught through role-playing and monitored by teachers and staff. Students earn consequences either positive or negative for their behaviors. Teachers are trained in the Boys Town Social Skills model and parents are aware of its use in the education of their children. Stella Maris Academy has adopted and implemented a Social Skills Curriculum based on the Boys Town educational model.